Original red silk over wooden boards, gilt and gauffered edges, in a blue morocco case. Gift of Mr. and Mrs. H.P. Kraus, with the assistance of the Fellows, 1986. Robert de Bourbon, Duke of Parma (? )(not in his sale, Paris, Hôtel Drouot, May 30-June 1, 1932); Ulrico Hoepli, Milan (? ); Libreria Tammaro De Marinis, Florence (? ); Arthur A. Houghton, Jr.; his sale, London, Christie's Dec. 5, 1979, lot 226. Ms. book of hours for the use of Rome (Hours of the Virgin, Office of the Dead); written and illuminated in Bruges, Belgium, ca. 1475-1485. The scribe signed Rombout on fol. 204v. Decoration: 15 full-page miniatures, full illuminated borders on miniature pages and on all facing text pages except fol. 190, numerous illuminated initials, filigree initials, and geometric line fillers; Flemish Gothic style. 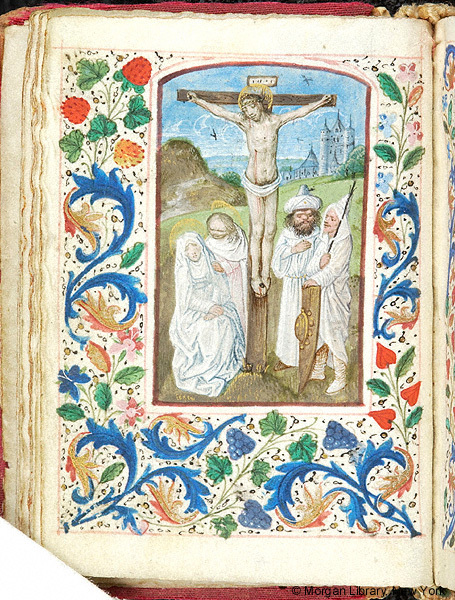 Artist: Master of the Dresden Prayerbook.